When it comes to selling homes - Experience Matters. 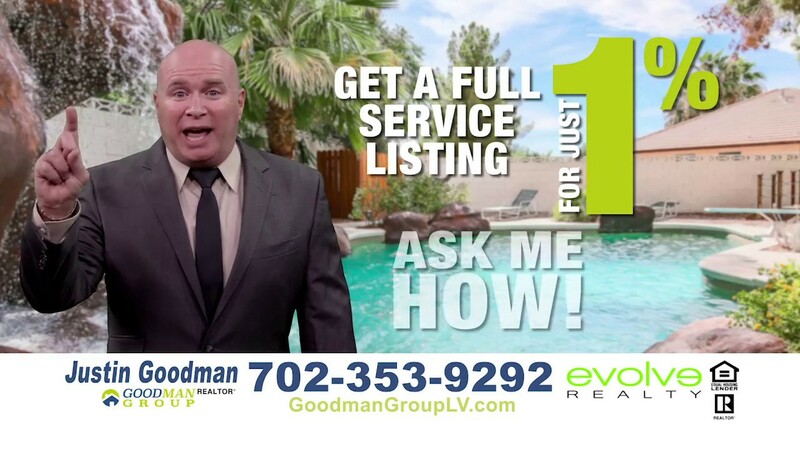 Whether you’re buying or selling, Goodman Group Las Vegas will make your time our top priority. If you have questions about putting your house up for sale, give us a call and we’ll be there to answer any of your questions in 5 minutes or less—guaranteed! There are plenty of Las Vegas homes for sale, so take advantage of our 1% listings and save some cash. Our Listings Sell for 20% More Money! Let Us List your home for 1%! We fully understand that selling a home in Las Vegas is a big decision and we take this very seriously. Typical listing agents charge a 3% commission or 3 times what we charge for the same service! We have a results-driven process that we have developed over the past 19 years. A process that is so refined, we can offer it to you for one-third of the cost of typical Las Vegas Real Estate agents. You can get started by first finding out what your home is worth in today's market with our Free Property Valuation Tool here. We are here to help you every step of the way through the entire process. It is important for you to work with an experienced real estate team like the Goodman Group to ensure you get top dollar for your home. To make your decision easy, we offer the best listing service for only 1%. This means you get more money in your pocket! Helping you to accurately price your home. Provide guidance on how best to enhance the perceived and real value of your home in order to command the highest asking price. World class marketing/exposure of your home to potential buyers, including: staging tips, photography, massive internet exposure, and more. Finding and securing a qualified buyer within your unique time frame. Helping you to avoid the two biggest reasons sales fall apart - low lender's appraisals and problems with the home inspection. Honesty and expertise are at the core of our business. So, regardless of the price of your home, when you hire us, you are taking the best steps possible to be prepared for a successful sale. SELL MY HOME LAS VEGAS! Goodman Group Las Vegas offers an excellent service guarantee: no other real estate agency will be there for you every step of the way like us. From the moment you decide to sell your home to the moment you hand over the keys, we’ll be your helpful guides. Find out today with our FREE property valuation tool. Contrary to popular belief, the ideal price for your property is not determined by an agent or the seller - it is dependent on current market conditions. We utilize accurate, up-to-date Information to choose 5 actively listed houses, 5 listings pending purchase, and 5 sold properties which are most similar to your home. With this information, we're accurately able to ascertain your home's current market value based on our vast local market knowledge and your home's condition and amenities. Equipped with this information, we advertise your property in such a way that your listing sells promptly for the price you deserve. We know that pricing your home correctly the first time is one of the most important steps in ensuring a successful sale. That's why we go the extra mile and personally pay for an appraisal from an unbiased Certified Residential Real Estate Appraiser. This step gives you that extra peace of mind that your home is priced properly to attract the right buyer. Today's home buyers are choosing which houses they will visit through extensive online research. Your houses first impression online matters now more than ever. Through a mix of Staging Suggestions, HD Photos, and Virtual Tours - Your home will be shown online in the best light possible to create a lasting first impression which attracts your purchaser in to see more. We make sure that your home is found where buyers are looking. Buyers today search for homes across a wide variety of sites. To attract the most buyers to your home, we push your listing to all the most important websites and beyond, such as: our website, home search portals (like Zillow, Realtor.com, Redfin, etc..), search engines, and social media sites. While today's buyers search extensively online, they still find homes through other channels. Through a combination of time-tested strategies, like: Open Houses, For Sale Signs, Mailings, and more - we reach home buyers in the real world, ensuring no opportunity is missed to get your home in front of the perfect buyer. With almost 100 Million average monthly visits, Zillow, Trulia, and Realtor.com are important property hubs that buyers have shown they want to use. Therefore, we take great care to be certain that your home listing looks amazing on those websites and is included in the top results for homes matching your buyers' criteria. Facebook, Youtube, and Twitter are in the top 10 most visited websites yearly - this is exactly why we're proactive on social websites to promote your house in front of potential buyers before they even know they're buyers with our social media campaigns. This creates interest in the home which might not have been found in other channels. We don't just rely on the real estate site juggernauts for exposure for your home. We take a proactive approach using our very own best-in-class website GoodmanGroupLV.com. This takes your home the additional mile by guaranteeing dedicated exposure that is featured on the internet. Not only do we use technologies to guarantee the widest exposure for your house, we also utilize the true and tried method of building our very own network of associate businesses, and brokers, buyers that help locate the right individual for your home. While open houses are not the principal search tool for locating a house they are an important facet of your home search process. In fact, the men and women who come to open houses are some of the most qualified buyers available. This is why we make an effort to run open houses in your home to reveal the neighbors and people most interested in your home. Our team takes great care to advise you of the best strategies to stage your house for sale in the current market conditions. Some of our staging tools include: including or removing furniture, changing wall colors, general cleaning, and adding or removing art. Some customers opt to utilize our recommended professional staging service in order to fully maximize the in-home experience for potential buyers. Our biggest exposure process is to put your home in the Las Vegas Valley Multiple Listing Service (MLS). This is the database of all homes available in the Las Vegas Valley that real estate agents use to find homes for their customers. Family and friends are one of the major reasons why buyers go into an area. We make sure to let the local neighbors know that your house is for sale through a community mailing. In the end, this brings in more attention from qualified buyers that are currently searching for a house in the area. Communication. Hear and Be Heard. We all know that one of the greatest factors that will make or break your home selling experience is how well we communicate. All our procedures center around proactive communication to you about any important updates regarding your home sale. We'll check in with you at least once a week, but in the event you have any questions, we're also available 24/7 to assist you in any way we can. Click below get started or get your questions answered.